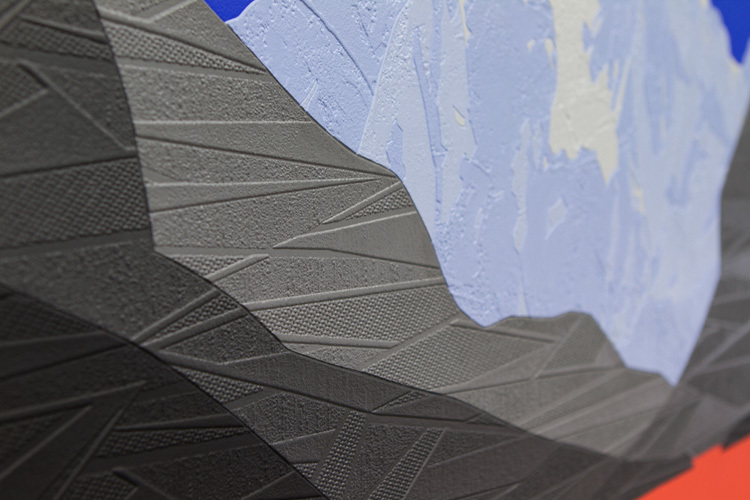 The Other Art Fair: Initially your work appears to adhere to the traditional genre of landscape painting, but on closer inspection, the skillfully collaged layers are apparent. What draws you to the type of landscapes you portray? 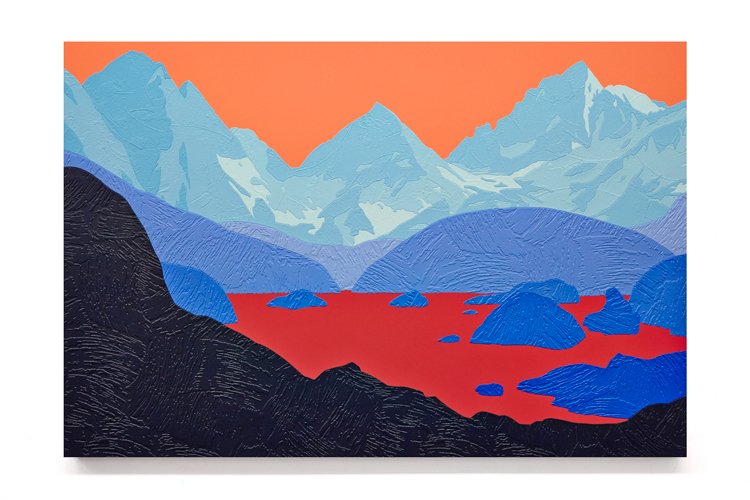 David Wightman: I want my work to be a continuation of the tradition of landscape painting. I’m aware that it doesn’t quite fit comfortably within that tradition though. All of my landscapes are fictional. I use different source materials – postcards, photographs, paintings, and personal sketches – to construct new landscapes that are both unlocatable and unknown. I want my landscapes to exist as archetypes rather than definite locations. TOAF: Your use of wallpaper is unusual and very striking. When did you first start using this material? Was this purely for aesthetic reasons or to explore the relationship between the manmade vs the natural? DW: I started using collaged wallpaper in my work when I first moved to London. I grew up in a house decorated exclusively with highly-textured wallpaper and, after finding a discarded roll of wallpaper in a storage cupboard at art college, I decided to try to use it in my work. I had just started to explore different approaches to making paintings and wallpaper fitted with this exploration. It was only later that I realised how much the wallpaper made me think of home and I began to use it as a direct reference to my own background. TOAF: How do you choose your evocative titles? DW: My titles are influenced by song lyrics, poems, favourite names, and interesting words. I had been envious of bands like Cocteau Twins who, as their lyrics are a form of glossolalia, were completely free to choose song titles without constraint. I decided to adopt their approach and, as a result, I have a collection of interesting titles and words waiting to be adopted by completed paintings. One of my recent paintings [Celestine] is named after a collectors’ daughter who asked me how I title my work. Celestine is a particular favourite piece of mine as the colours used in the lake and sky are based on colours I observed and mixed while visiting Bermuda last year. TOAF: How formative was your time at the Royal College of Art in the development of this artistic style? DW: While at the Royal College of Art, I started to concentrate on using wallpaper in my work along with settling on abstraction and landscape as the twin pursuits of my practice. I was always told to make my work uglier but I tried to go in the opposite direction by concentrating on formal aspects of my work: colour, texture, composition. I don’t think my work fitted in with their aesthetic at the time which was very anti-painting and anti-beauty. It made me realise how much I wanted to find my own path and explore paint and colour on my own terms. TOAF: You first exhibited at The Other Art Fair in October 2014. How did visitors respond to your work? Did you receive any unexpected observations or questions? DW: One person asked where I’d learned my collaging technique and posited that I’d been taught an ancient method of paper marquetry by a Japanese master. He was very surprised to learn that I invented the technique myself. TOAF: Please tell us about your recent collaboration with high end Swiss fashion label Akris. Is this the first fashion-art crossover for you? How did the relationship work with Akris? Was Lorelei the inspiration for the clothing range or commissioned for this purpose? DW: Akris approached me after seeing one of my paintings - Lorelei. They wanted to collaborate by turning the painting into a textile design for their Akris Punto Fall / Winter 2014/15 collection. We decided to use the original magenta colour of the lake for half of the collection and tweak the colour to a gold / tan colour for the other half. This ties in nicely with my use of variations in my own work. We also decided to turn the wallpaper textures of the original painting into different textile textures for different items of the collection. For the official launch we transformed their Mayfair boutique into a gallery and catwalk for one night featuring my new work along with models showing-off the different items. The whole collaboration was a huge amount of fun! I’d love to work with other fashion houses in the future. TOAF: What advice would you give to an aspiring artist? DW: Say yes to opportunities and get used to making sacrifices to make your work. Don’t expect anyone to chase you. TOAF: What’s next for you? DW: I’m working on a few secret projects and private commissions along with a solo show at Long & Ryle next year.